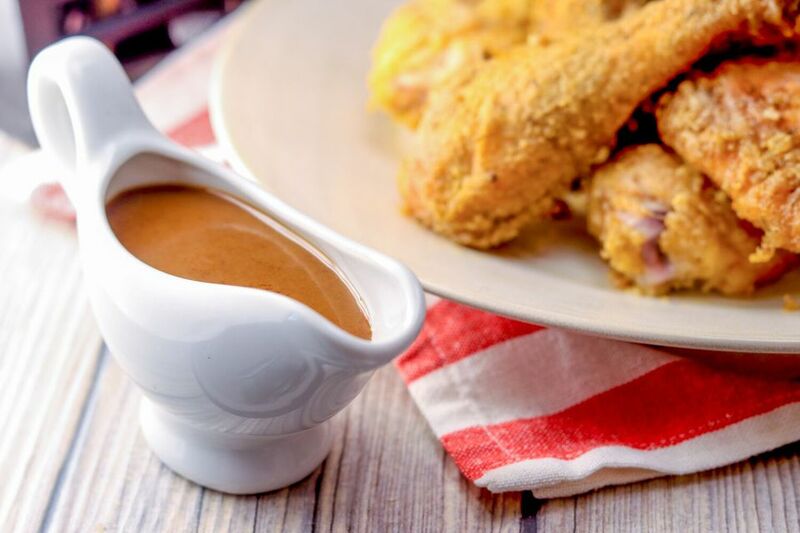 There are several ways to make gravy: it can be thickened with a cornstarch slurry, made smooth with the addition of a roux, or served simply as the drippings straight from the pan. Gravy made with a roux—a mixture of fat and flour—is a classic preparation, using the pan drippings from your holiday bird or roast. The roux adds intense flavor and a velvety texture to the gravy. But don't worry if you aren't cooking a whole turkey or beef roast in the oven—you can also make a roux gravy with butter or oil to amp up an everyday chicken or to top Salisbury steak. A roux combines equal parts fat from either oil, butter, or the renderings of the roasted food, along with some flour. It can be used as the base of a sauce or as a thickener in dishes such as clam chowder and macaroni and cheese. Roux ranges in color from pale to deep brown, darkening the longer you cook it. A lighter roux preserves the flavor of the fat—whether butter or pan drippings or lard—whereas a darker roux takes on its own nutty, caramelized character. You can decide how long to cook the roux depending on how you plan to use it. For example, you want clam chowder to retain a white, creamy color, so a pale quick-cooked roux works best. Gumbo, on the other hand, can benefit from a deeper, more complex-tasting roux, so cooking it down until darker is best. For a holiday gravy, you might prefer something in between, perhaps in the color range of peanut butter. The ratio of fat to flour to liquid is important when making a roux-based gravy, and depending on how thick you like your gravy, you can adjust the amount of fat and flour. To make 1 cup of roux gravy, start with 2 tablespoons of fat, 2 tablespoons of flour, and 1 cup of liquid. (If you would like a thinner gravy, decrease the fat and flour measurements to 1 1/2.) The liquid can be broth, milk, or heavy cream, depending on how rich and decadent you want the finished product. You can also combine smaller amounts of heavy cream or wine with broth for added texture and flavor. Making a roux gravy isn't difficult, you just need to make sure you have all of the correct proportions. First, determine how much gravy you need and then adjust the fat amount up or down if necessary according to the basic formula. Measure the amount of fat or oil in the pan drippings after you cook your turkey or another piece of meat—you can pour all of the drippings into a liquid measuring cup and then remove what you need, or simply scoop out the amount of fat with a tablespoon measuring spoon and set aside. (Discard the remaining drippings or save for another use.) Add butter, cooking oil, rendered bacon grease, or lard if you need to increase the volume of fat. You can prepare the gravy right in the roasting pan (making sure to first pour off any extra fat beyond the amount you need for gravy), which allows you to scrape up the brown bits of flavor stuck to the bottom. Or, if you prefer, transfer the drippings to a clean saucepan or skillet. Bring the fat back up to a medium-low temperature if it cooled. Sprinkle an equal amount of all-purpose or Wondra flour onto the hot fat and cook it, whisking continuously, for at least 5 minutes over low heat to remove the raw flavor of the flour. Add the corresponding ratio of liquid slowly to the roux while continuing to whisk it. Bring it to a simmer whisking continuously to prevent lumps until it reaches your desired thickness. Keep in mind that the gravy continues to thicken as it stands, so resist the urge to speed up the process by adding additional flour. Once the roux gravy is cooked, you may decide to alter the consistency and flavor a bit. To thin the gravy, add a little more broth. To thicken runny gravy, cook it a little longer. Unless you started with a heavily seasoned piece of meat, you probably need to add salt and pepper before you pull the gravy off the stove. As a general rule, stir in 1/2 teaspoon of salt for each cup of liquid, but make sure to taste first. Use a fat separator if the gravy seems greasy. For an exceptionally smooth gravy, strain it through a sieve into your serving boat or bowl.